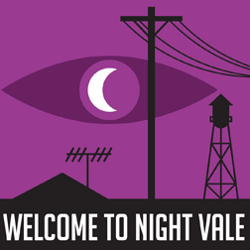 Coming as late as I did to the “Welcome to Night Vale” party train, a solid year or so of binge-listening has made me a fervent fan. Described by many as “The Prairie Home Companion” crossed with “The Twilight Zone,” the twice-monthly podcast added a live show element a year after its debut. I had never had the chance to see one of the live shows before, but even without that extra preparation I was super-excited to see the show last night at the State Theater in Minneapolis, Minn. Opening the show and playing a musical interlude right at the climax of the show, Austin, Texas-based singer-songwriters Danny Schmidt and Carrie Elkin played three or four songs which showcased their talents very well. Of the duo, I was more impressed with Elkin’s voice than with Schmidt’s; however, the two complemented each other greatly as they took turns leading their songs. Schmidt’s “Standard Deviation” earned the most enthusiastic crowd response, but because I had difficulty hearing the lyrics, the cleverness of the song was lost on me. They were selling a small EP of the songs they played for the tour which cost $5 with the purchase of one of their CDs, free if you bought more than one. I chose Elkin’s Call it My Garden CD and was surprised and pleased to learn that it was produced by Red House Records from St. Paul, Minn. Schmidt’s work has been featured on “Night Vale” before (in the eighth episode called “The Lights in Radon Canyon”), and I thought the duo’s acoustic guitars and dreamy vocals really helped prime the audience for the mood of the show. The premise of the episode for this tour is that the Night Vale City Council is holding a regular contest where every citizen tells a ghost story and the winner gets to be turned into a ghost. We got to hear ghost stories from teen anarchist and bibliophile Tamika Flynn (Symphony Sanders), a sentient patch of haze named Deb (Meg Bashwinner, whose Minnesota-tinged accent was just perfect in this audience, donchaknow?) and a computer programmer named Melony Pennington (Molly Quinn). Of the guest appearances, I loved Quinn’s performance the most because she filled her character with the right combination of cynicism and pragmatism which I’ve come to find is a hallmark of every person who works extensively with computers. Each of the little stories pulled you in and then pulled you back out again with the characteristic “Night Vale”-ish twist that even a casual listener of the show can understand. It was radio host Cecil Palmer’s ghost story offering which drove most of the show, though. Told brilliantly by actor Cecil Baldwin, it was frequently interrupted by the other segments of the show right at climactic moments in the way that all the best radio shows used to do. There’s a quality to Baldwin’s voice which makes it hard not to listen to him and be drawn into everything that he’s saying. And as for the Night Vale-ish twist…? Well, suffice to say that it not only deepened the Cecil character more but it also transcended the story to become a universal truth for everyone who has ever encountered a ghost in their past or present. The other regular parts of the show such as the “Community Calendar” section or the horoscopes were fine and garnered the right amounts of laughter and whooping (especially when audience members responded to Palmer calling out their horoscope sign), but in contrast to the main story and especially after the ending they seem unimportant. Half a day after show, I distinctly remember what Palmer’s voice sounded like when he got to the denouement of his ghost story more than when he announced what was in store for all the Virgos like me. All in all, I’m very glad that I got to see this production and I hope that as the tour makes its way along the East Coast, to the West Coast and through Europe you get a chance to see it too. Here are the lyrics to Standard Deviation! A chalkboard full of secrets / it was like some kind of code / to tell the stars and planets how to fall / and how to glow / but when she turned to face the classroom / there was chalk upon her nose / like the ghost of Madame Curie / or a clown in womens clothes / And the boys dismissed the work so quick / they laughed at her instead / just a girl who spilled some numbers from her head. Well the girls eyes lit with fire / like milk and kerosene / it was the smartest thing she’d ever heard / the hottest thing she’d seen / so she grabbed her by the brain stem / and she threw her to the floor / they kissed like their equations / had never balanced quite before / Yeah cause every lonesome thesis / just describes the unobserved / there’s always one who’ll fall upon the tail of every curve / there’s so many locks / so many doors / so many twisted keys / it’s just the standard deviation from the mean. There’s so many locks / so many doors / so many twisted keys / it’s just the standard deviation from the mean. Alas, I just checked Danny’s website and it’s not listed on the most recent album. Also, the way they pitched the EP makes it sound like they really want to sell their other albums during the tour so I don’t think that he’ll be releasing the EP separately, which is a shame. However, what I think they could and probably should do is that after the tour is over, they should release a live version of the EP for a slightly higher cost than what it was selling for during the tour, using the best audio/audience reaction they can get from the sound boards of any of the performances.